When I left my 9-5 job to work on my own ventures, including Los Tweens, I had grandiose ideas of spending lots of time with my three kids, exercising regularly, and working on those scrapbooks I’ve been swearing I’d put together since Maddy was born 10 years ago. Reality – (a reality which many business owners and bloggers can attest to) I work almost 24/7, there are never days off, I’m lucky if I have time to go for a jog, and those scrapbooks are still collecting dust. This morning I was exhausted. After working into the weeeee hours of the night and then spending the rest of the sleeping hours soothing a teething and feverish baby, I woke-up grumpy, tired, and ready to throw in the proverbial towel. 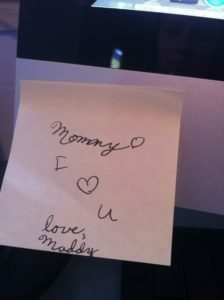 But then it happened, the moment of clarity where I realize its going to be fine – a sticky note attached to my computer from my tween (photo below). We all work hard to do the best for our kids and in the end (and if this sticky note is any proof) they realize and appreciate it. If we instill in our children, al igual que mis padres hicieron conmigo, that hard work is important to succeed then we have taught them more than a few scrap books and a slimmer mom could ever accomplish. This entry was posted in Personal and tagged bebes, entrepreneur, exhaustion, Family, kids, mamas, Mami, Mom, padres, teething, Tween, Tweens, Tweenversations, work. Bookmark the permalink.